I really like Google Reader’s shared items. This way other people (hopefully with similar interests) filter the good stuff for free. For instance, I’ve noticed Crazy Bob shared several Chumby links. Which made me think…wtf is Chumby? No, Mom…I didn’t say I had a “Chumby in bed”…I can’t believe we’re having this conversation. My Chumby is on the nightstand next to my bed. When you wake up, you stay in bed for an hour to listen to the latest JavaPosse episode. OK, that seems weird to me. I never lay in bed and listen to my clock radio. The alarm goes off, I hit snooze a few times, and get up. Then again…the prospect of browsing certain kinds of craigslist ads while in bed may appeal to some people…if you’re into that sort of thing. 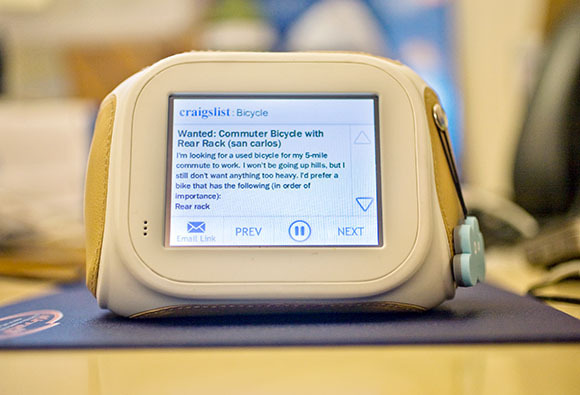 But wait…this article says Chumby is for your desk. That’s nice and all, but my desk already has a computer on it. A real computer with two big monitors, good speakers, a huge hard drive, and a fast wired network connection. Using Chumby as a digital photo frame makes the most sense to me. The price is fair and they don’t charge a monthly service fee. This might make a nice gift for someone to better keep up with extended family pictures. I dunno…I guess I’m not really sold. If accessing the Internet from a non-PC-equipped room is your goal, perhaps an iPod Touch makes more sense? At $299, the iPod is more expensive, but offers vastly better mobility. I can definitely see myself sitting on the back patio this summer with an iPod. But dragging a Chumby outside and plugging it in? That’s not nearly as convenient. Posted on Monday, March 3rd, 2008 at 11:52 pm in Apple, Technology. Where are the Native Vista Apps?